Ask any triathlete which races they think will have the highest rate of starters who did not finish (DNF) for one reason or another, and they'll likely mention one or more of our top 25 Toughest Ironman races. Ironman events in St. George, France, and Lanzarote, featuring monster bike courses, would have been our picks. But the data tells a different story. Believe it or not, Ironman Lanzarote has the lowest DNF rate: an astonishingly low 2%. St. George easily had the highest DNF rate at 16.5%. 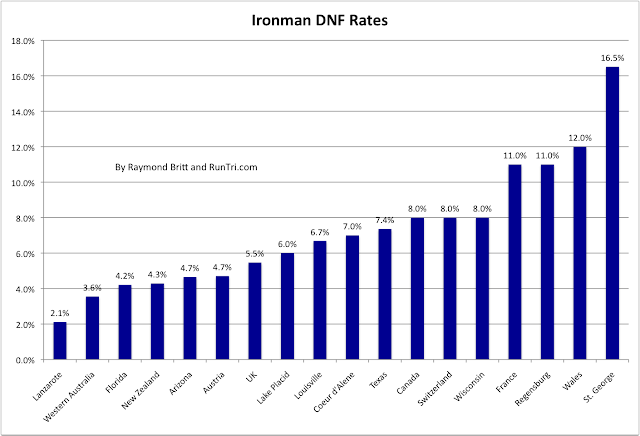 France, Regensburg and the new race in Wales all had DNF rates over 10%. The flat courses in Florida and Arizona help limit DNFs, while tough bike courses in Texas and Wisconsin push DNFs to the 7%-8% range. We took a closer look at Lanzarote and Lake Placid. 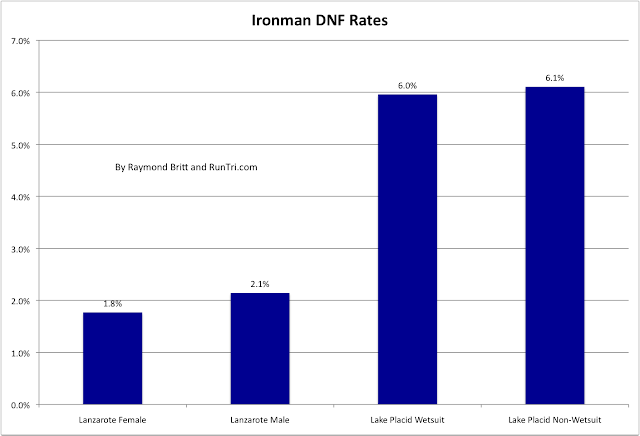 Lanzarote sorts results by men and women; only 2 women out of 113 starters DNF, 1.8%. Of the men, only 2.1% DNFd. One thing appears to be certain: those who have chosen to race Lanzarote are extremely ready for every challenge on the course. They finish, no matter what. Impressive. At Ironman Lake Placid 2011, water temperatures were high enough that only those who swam without a wetsuit were eligible to qualify for Kona. More than 600 chose to swim sans wetsuit, and more than 1800 raced with the benefit of wetsuit buoyancy. Was there a difference in DNFs between the wetsuiters and the non-wetsuiters? No.